Promotional Flags - Hightech Signs, Inc.
Hightech Signs in Charlottesville can custom print your business logo or branding message on a wide selection of outdoor promotional flags. Advertise your sale, bring in new customers, and create awareness for your event with the eye-catching movement of printed flags. We love working with our customers to create visual marketing campaigns. 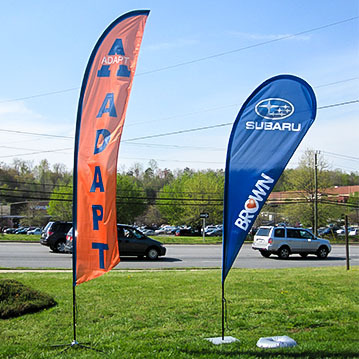 Find out more about the outdoor advertising options of custom printed promotional flags.